Many of the better things in life are worth waiting for. And sometimes a person doesn’t recognize these “better things” until more experience and perspective is gained, further on down the road. This has been the case in our quest to find an economical and reliable means of transportation back and forth to town from our remote southern Idaho ranch. Ten years ago Rick and I made our move to the beautiful desert regions of Owyhee County Idaho with all our worldly possessions and a dozen head of horses. Escaping the mud and dreary weather of northern Idaho was one of our goals, but also having unlimited riding and training possibilities for our Arabian Endurance Horse business made our choice exciting and challenging. Before long it became clear that we would be “enduring” driving the 100 plus mile round trip into town much more often than we had anticipated. Living in our remote location necessitated our being creative in finding ways to make ends meet, i.e. keeping those hay feeders filled, as well as having a little left over for “grub” for ourselves. We have both been self employed for many years and find entrepreneurial lifestyles to our liking without having to punch a clock or have a “real job”. We are continually striving to be more self sufficient. Translation: living better on less is second nature to us, both being of the “old hippy “persuasion! Thus, the hunt was on for the proper vehicle. Excellent fuel mileage was a given as was repair ability. Rick is an excellent mechanic but the “newer” vehicles, with all the computer controlled devices are difficult for a “backyard mechanic”. Alternative fuel potential was another requirement for our “perfect” vehicle, so the research began. By this time we were collecting fry oil and researching making our own bio-diesel, with which we now also heat our home. 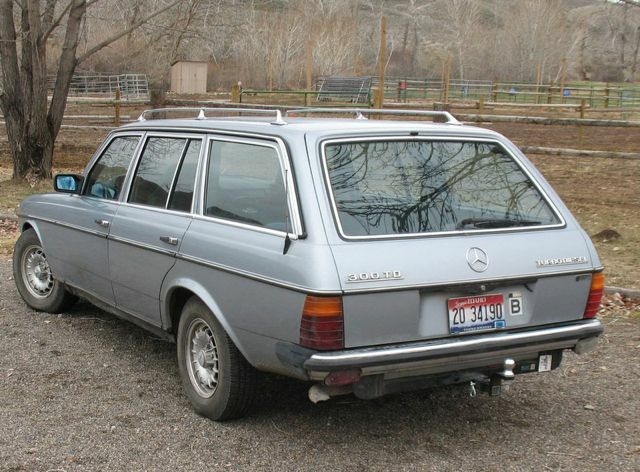 After several false starts involving different Volkswagens, We decided to look for a Mercedes 300TD. Being in the desert of Southern Idaho, that was easier said than done! The closest one we found was a hundred miles away. It had a rebuilt engine and a two tank grease kit .We drove to see it. What a beauty, paint was perfect. Interior was perfect. Wow! We started the engine and went for a drive. Ooops suspension was terrible, transmission felt like it was going to fall a part and worst of all the engine had massive blow by. Hmmm rings must not have seated after the rebuild. What a let down! So we drove back home and I made a list of five potential 300TD Wagons that were for sale. Many days and phone calls later, I had narrowed it down to one near L.A., 1,000 miles away. It was in very good shape, but it all sounded too good to be true with only 127,000 “original miles”. We would be paying a premium for low miles but thought it would be worth it. I purchased a plane ticket and started making plans for the trip. At the last minute things came together to show that the seller had fibbed about the milage and changed the odometer. The vehicle actually had closer to 280,000 miles on it. What a bummer. I cancelled the trip, the search continued. After several other dead-ends and false starts, we found what sounded like a good one (in a round about manner by word of mouth.) 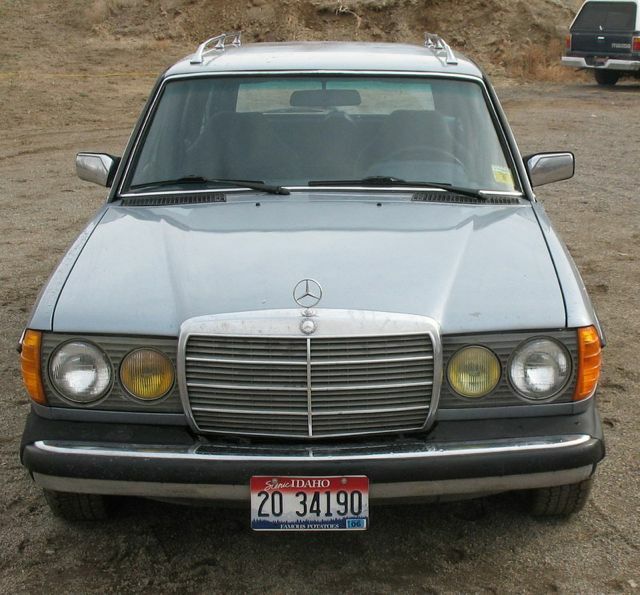 She was a 1984 Mercedes 300TD, Euro Model . The owner had moved to Mexico and the car had been sitting for 2 yrs in a garage. We had been told by acquaintances that it was in perfect shape and that everything worked. So we tracked down the owner and yes, the car was for sale! Over all in really good shape! The garage owner had charged up the battery. When turning the key, I notices the glow plug light only came on for a second. She turned over 8 or 9 revolutions, 3 or 4 tries, and then started up. We aired up all the tires and off we went for a test drive. The tires were out of round so the ride was strange and it was hard to tell what shape the suspension was in. --Best of all, very little blow-by, the engine purrs! We talked to the owner and pointed out the problems, especially that the glow start system was not working properly and the bad tires. We offered him $500 less than the asking price and he accepted our offer. We put on a new set of tires, had the oil changed, had all fluids checked and off we went on our 600 mile trip back home to southern Idaho. The trip home went well. The 300TD (now affectionately known as Sadie), had lots of power and was comfortable and quiet. Now Rick’s quest to turn it into a reliable, daily driver starts! Upon getting back to Idaho and to temperatures of around zero, the Mercedes would not start. 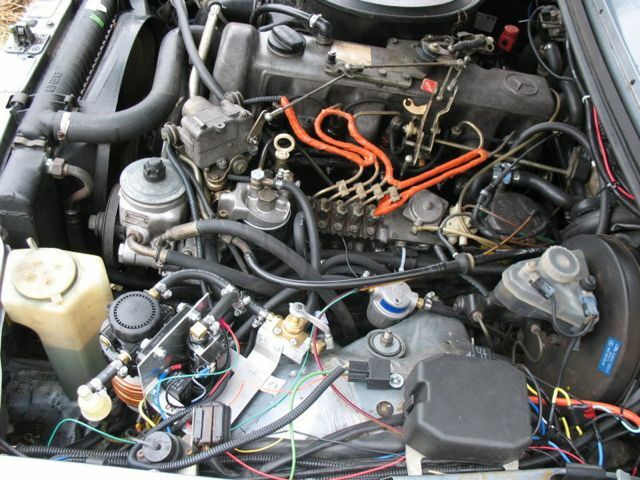 I got online and began looking for information on the glow plug starting system. I found Mercedessource and ordered a bunch of do it yourself manuals--what a gold mine of information!! I also needed to get a block heater installed pronto! I began researching the block heater. I could not find the proper port on the block of the engine. Some online sites were recommending putting in a front radiator hose heater as a good solution, so I decided to go that route. I bought a new hose, a new hose heater and new antifreeze. I got it all installed, plugged it in and---nothing! So I re-drained the antifreeze, took the defective heater out and ordered another new one. Then I installed everything a second time. It worked just fine if all you wanted to do was heat the radiator! Almost NONE of the heat went to the engine block! After an all out search I finally found the correct port in the Mercedes’ engine block: it is just forward of the starter and slightly higher. It takes a 19mm Allen Wrench to get it out. I found by taking off the air filter and air filter bracket I was able to get a five foot breaker bar in from the top. A little bit of heat from my torch and the old plug broke free. I had a 500 watt block heater ready to go in. I put in the antifreeze and plug, connected the electricity and WALA! And this is how to keep your engine nice and toasty even in sub zero weather!! I was happy with the compression but still had my starting problem. I decided to change the glow plug start system so that I could control it manually. I took out the factory relay and put in my own, with a switch on the dash for finger control while starting. These changes helped my starting problem, but it still wasn’t right, though I felt good about manually controlling the glow plugs. One of my concerns in the winter is that there would be problems starting the engine again after the car sat in town at the store or while we visited friends for 4 or 5 hours. This starting problem continued to plague me but it was part of the impetus for making sure all other systems were working properly. I bought most of Mercedessource’s manuals about the Mercedes W123 chassis and started going through the list for making a car into a daily driver as well as converting it to WVO. I had put in new injector nozzles‘, changed all the fluids, all the filters, and all the old rubber on the rear and front ends. Basically the car has a new suspension system both front and back. All was running really well except the delay in starting issue. I was beginning to think it might be timing. I decided to purchase the Mercedessource STC 1000 WVO Kit. What a beautiful kit! Part of the add on for this kit is the extra fuel pump which is installed back near the fuel tank. I installed this fuel pump first and Wala!! Sadie fired right up, beautifully! What a relief, now I turn the key to first position auxiliary and the fuel pump comes on, building up the fuel pressure. Next key position, the starter motor engages and the car fires up instantly! I LOVE it!! The STC 1000 Kit dropped right into place. Just drill two holes, put in a few bolts, hook up the fuel hoses and electrical wiring and you are done. It only took a couple of hours. Three years ago I converted a 1980 VW Dasher to WVO. It took me a solid week of concentrated work to complete the job! What a time saver this WVO kit from Mercedessource is! So far it has worked really well. In the near future, my next project will be to add a second WVO tank using the Mercedes Source DTC 100 Kit (dual tank). Well, all in all fixing up this beautiful little Mercedes Wagon has been a fun adventure! What a pleasure to drive this nice car! The do-it-yourself books and kits from Mercedessource are a treasure and have made it all possible.